Hydro power, also known as hydroelectric power, is the process of generating electrical power from moving water and is one of the worlds largest sources of renewable energy. Most hydroelectric schemes use large dams for retaining a reservoir of water. This reservoir of water is replenished by the rivers and streams from the surrounding countryside. But micro-hydro electric systems can also be used to generate electricity from smaller water powered generators located in small rivers and streams at the bottom of your garden. Hydro energy depends upon local conditions but you need to have some flowing water for it to work. It isn’t necessary to have very much, or much pressure, and it doesn’t have to be very close to the hydraulic turbine as pipework and penstocks can divert it. Small hydro projects can generally be categorised as either “run-of-river” or “water storage” (reservoir) schemes. Unlike water storage schemes which use dams or reservoirs to store the waters potential energy, run-of-river schemes use the water that is instantly available within the natural flow of the river. The use of hydraulic turbines for the generation of power has a very strong historical tradition and one in which the moving water turns a wheel or a runner like a propeller to generate rotating shaft power. As water and is not compressible, the runner converts the moving energy of water into mechanical power by turning an output shaft to produce electricity. Hydro runners come in different shapes and sizes depending on the site and the type of turbine. The two basic types are those which operate out of the water in air and those that operate totally submerged in water. The Impulse Turbine is the most commonly used type of turbine in domestic systems and one that operates in air by having a jet of water sprayed directly at it from a well positioned nozzle. A water turbine is the main piece of equipment in any hydro power scheme and converts the water’s energy into the rotating shaft power. The impulse turbine uses the kinetic energy force of the directed water (or another fluid such as steam) for the production of power. The selection of a suitable turbine for any particular hydro site depends mainly on the head and flow characteristics of the site. Impulse turbines are better suited to those schemes with high head heights but as all turbines have a power-speed characteristic, the lack of head height can be compensated for by the pressure and velocity of the water jets. Impulse turbines can be driven by one or more high velocity jets and the most common type of impulse turbine design is the Pelton Wheel. The impulse turbine extracts energy from the water by first converting the available head into kinetic energy in the form of a high-speed jet discharged from the nozzle. All the pressure drop occurs in the nozzle and the runner operates at constant static pressure. The jet is directed on to buckets or cups fixed around the rim of the runner, with the cups designed to remove the maximum amount of energy from the water. Then we can see that for all practical purposes, an impulse turbine is simply a standard waterwheel with specially designed spoon shaped water cups. The Pelton wheel is a type of impulse turbine that is driven by a single jet of water positioned in the plane of runner. The high velocity jet possessing sufficient amounts of kinetic energy strikes the buckets in succession at atmospheric pressure and mechanical rotation of the runner is produced. When the water strikes the buckets fitted on the periphery of runner mechanical energy is produced. The buckets of an impulse turbine are shaped to form a double hemispherical type cup. The water turns through 160o inside the shaped bucket, which is the maximum possible angle without the return water interfering with the oncoming jet, and exits at the outer edge of the bucket before falling as waste water below. For a small hydro scheme water turbine, a single jet arrangement is sufficient to cause rotation but the power of a given runner may be increased by using more than one jet. In multi-jet arrangements the nozzle jets can also be connected to a speed governing mechanism to regulate the quantity of water coming out from the nozzle, thereby regulating the rotational speed to a maximum value. This type of hydraulic turbine uses the energy within the water only once. However, efficiencies reaching 70-80 per cent can be achieved by using more nozzles position equally around the runner. Generally the optimum speed of rotation of the impulse water turbine is about half that of the speed of the water and is therefore used for high heads and high water speeds, but relatively low volumes of water. Impulse turbines are widely used in micro-hydro schemes because they have several advantages over other types of hydraulic turbine. For example, they are simple to design, easier to fabricate and maintain and have greater tolerances towards sand and other particles, such as stones and grit, in the water. Then we have seen that an “Impulse Turbine” similar to the Pelton design can be used to produce hydroelectric power. The impact of directed water onto the shaped buckets causes the runner to rotate, thus developing mechanical energy. The main point to consider when selecting a hydraulic turbine for a particular application is the net head height of the water. Also multi-nozzle designs are capable of providing greater outputs in some small scale hydro power sites. Single jet impulse turbines are not suitable for use with an automotive alternator to generate electrical power as they have lower rotational speeds, then the rotational speed would have to be increased using gearboxes or pulleys. The multi-jet Pelton, and even the Turgo Turbine are suitable for medium heads as the Turgo runner design allows for more efficient escape of discharged water and thus a larger incoming water jet. 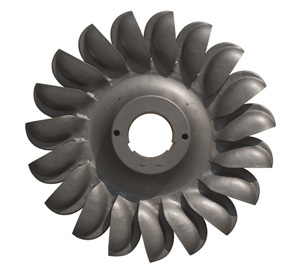 As a result, a Turgo turbine can provide equivalent power to a Pelton turbine with a smaller diameter runner. For more information about “Impulse Turbines” and how you can use them to generate your own electricity using the power of water, or obtain more hydro energy information about the various small scale hydro energy systems available, or to just explore the advantages and disadvantages of hydro power, then Click Here to order your copy from Amazon today about small scale and low head hydro systems which can be used for generating electricity.